This cartoon is so spot on, and not just because Radium is in fact deadly. When there are so few women in a field, the pressure to be great is immense, not only because you feel the need to defy stereotypes about your gender’s inferiority, but because you feel the pressure of representing your entire gender. It’s a double-edged sword: any success is extra sweet, because it’s a victory for your whole gender. But any mistake you make will reflect poorly not just on you, but on all the lady scientists – or lady comedians, or lady jockeys, or whatever (and of course, the token experience applies not just to gender, but to race, ethnicity, class, gender identity, sexual preference and ability, and it gets even more complicated for people who live at the intersections of any of those minority identities). That kind of pressure will make anyone a sorry role model. Miserable, and a sorry role model; you’re admired not necessarily because you were great, but because you were there. And to be fair, being there – being a woman and scientist at the turn of the century, for example – is sometimes an accomplishment in and of itself. Like Zombie Marie Curie says (I cannot believe I just typed that phrase), those Nobels aren’t decorative. 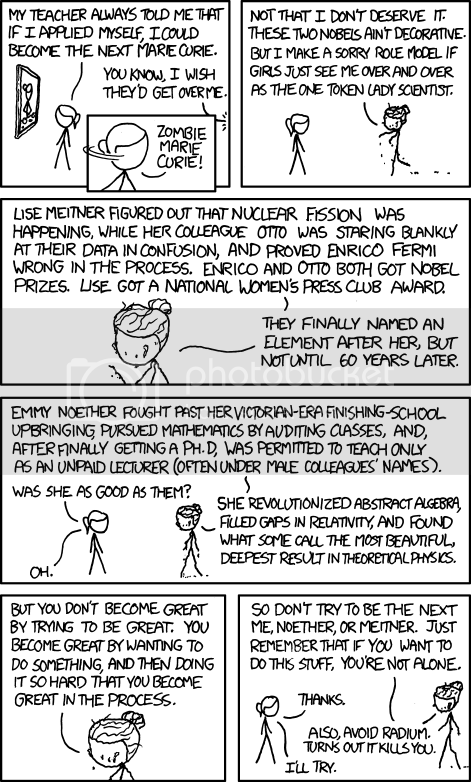 But women and girls who want to look up to great women scientists should have a range of great women to choose from. And Zombie Marie Curie is right about one other thing (yeah, I really did just type that, again): if the comments section on last Friday’s post, and my inbox, are anything to go by, you really are not alone. 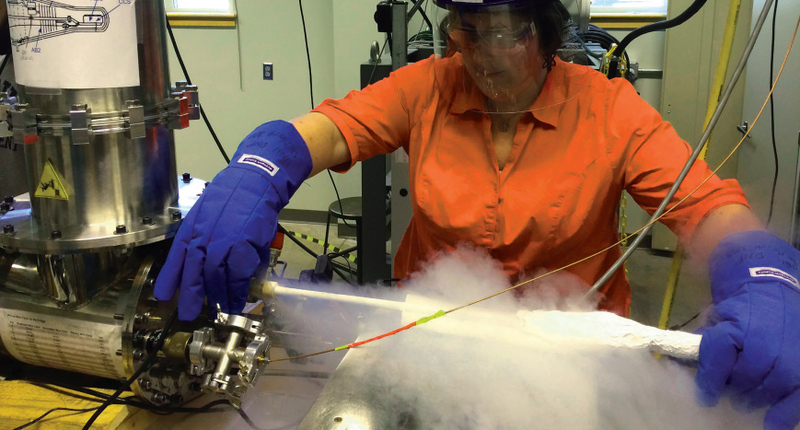 If you want to do this stuff – whether “this stuff” is physics, or Ultimate Fighting, or any other field in which you are historically underrepresented and still a minority – you are not alone. In a new report about the climate for LGBT people in physics released yesterday, over one third of respondents said they considered leaving their school or workplace in the past year, a number that correlated with experiences of harassment and discrimination. The report, produced by the American Physical Society’s Ad Hoc Committee on LGBT Issues, also found that LGBT women and people of color faced heightened levels of discrimination, with trans and gender non-conforming people reporting the harshest environments. 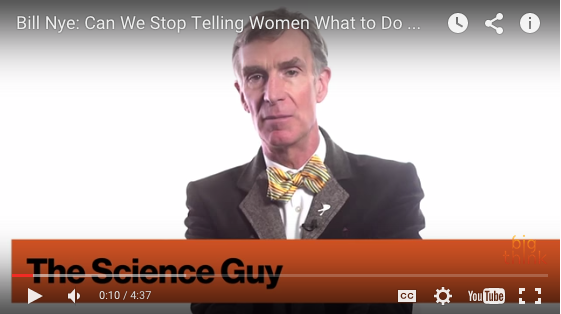 In a Big Think video entitled “Can We Stop Telling Women What to Do With Their Bodies?” a visibly frustrated Bill Nye the Science Guy valiently tries to convince anti-choicers who insist that a fertizilized egg is a full human being to respect science. Ever wanted to learn about science and then realized, whoops! I can’t understand science — I’m a lady! Comedian Megan Amram has your back.